El Cid El Moro Beach Hotel Honored with Top Award for 25th Consecutive Year. May 15, 2017 – El Cid Vacations Club proudly announces that all El Cid Hotels have received RCI’s prestigious Gold Crown Resort Award. RCI holds the distinction of being the largest timeshare vacation exchange network in the world with more than 4,300 affiliated resort properties world-wide, and of this vast network, only the top quarter of RCI’s affiliated properties achieve the Gold Crown Award designation. Additionally, all of El Cid Vacations Club’s resorts attained the prestigious Excellence in Service Award, which is given to less than 3% of RCI-affiliated resorts worldwide. This additional acknowledgment is only given to hotels that have received the Gold Crown recognition and that have also been deemed to offer their guests the highest standard of extraordinary service. This year, all five of El Cid Vacations Club’s Mexico resorts were honored with the two awards, which is considered a remarkable and rare achievement amongst multiple-resort companies in the industry. There can be no doubt that El Cid’s premier oceanfront locations, award-winning cuisine and its renowned standards of hospitality and service contributed to this year’s unprecedented sweep in the Gold Crown category, and with it, the Excellence in Service Awards. To further add to El Cid’s accolades, the company’s premier hotel in Mazatlán, El Cid El Moro Beach Hotel, received an additional special recognition for having been awarded the Gold Crown Resort Award for 25 consecutive years. This momentous achievement is considered incredibly rare as well, and it is a testament to the commitment the company has to providing premier vacation experiences to its members and guests. 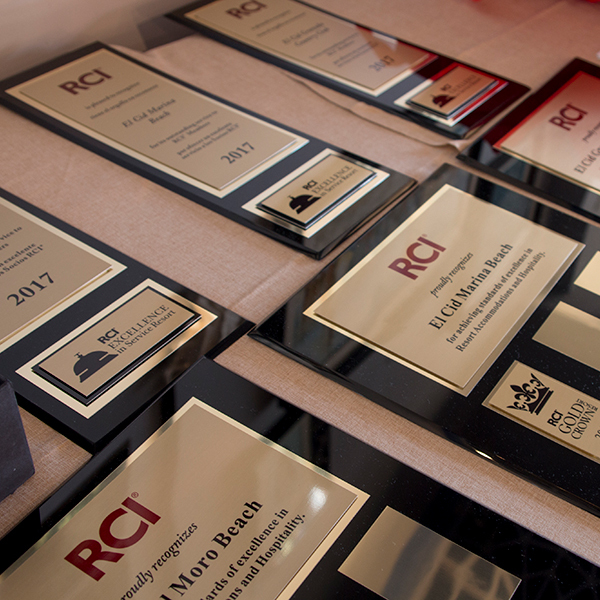 The Gold Crown Resort Awards are RCI’s most highly acclaimed awards, which signify that a property has attained the highest level of excellence in the industry. To be considered for the recognition, hotel properties must meet the precise quality and service requirements based on both RCI Member Comment Card ratings and an evaluation of resort facilities, amenities and services. RCI is the worldwide leader in vacation exchange with approximately 4,300 affiliated resorts in more than 100 countries. RCI pioneered the concept of vacation exchange in 1974, offering members increased flexibility and versatility with their vacation ownership experience. Today, through the RCI Weeks® program, the week-for-week exchange system, and the RCI Points® program, the industry’s first global points-based exchange system, RCI provides flexible vacation options to its 3.8 million RCI subscribing members each year. RCI’s luxury exchange program, The Registry Collection® program, is the world’s largest program of its kind with approximately 200 affiliated properties either accessible for exchange or under development on six continents. RCI is part of Wyndham Destination Network and the Wyndham Worldwide family of brands (NYSE: WYN). For additional information visit our media center or rciaffiliates.com. RCI also can be found on Facebook, YouTube and Twitter.